Night Beat was a mystery adventure drama broadcast from 1950 to 1952 on NBC. 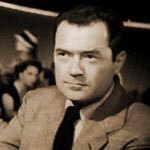 Against a backdrop of the newspaper scene in Chicago, Night Beat featured "Lucky" Randy Stone, excellently portrayed by Frank Lovejoy, as a reporter covering for Chicago Star. The stories were well-written by a group of outstanding writers, Larry Marcus, Russell Hughes, and Jack Neuman. There was a strong supporting cast, orchestra, and good sound effects. The plots in Night Beat deal with crimes, the common man in trouble, the greedy, the homeless, and the hopeless in the city of Chicago. Each episode is narrated by Lucky Stone as he investigates his leads. Prowling Chicago after sundown, Stone looks for a story "that grabs your heart and shakes it until it hollers uncle." Stone wraps up each story, pounding away on this typewriter and making his closing remarks. In each closing, Randy calls out, "Copy boy!" The story ends and rolls to print, and the newspaper hits the street of Chicago as the sun rises.